Bandon is a city in Coos County, Oregon, United States, on the south side of the mouth of the Coquille River. Start off your visit on the 17th (Fri): take in the dramatic natural features at Face Rock State Scenic Viewpoint. Here are some ideas for day two: identify plant and animal life at South Slough National Estuarine Research Reserve, then shop like a local with Washed Ashore - Gallery & Workshop, then immerse yourself in nature at Bandon State Park, and finally enjoy the sand and surf at Coquille Point. To find maps, where to stay, reviews, and tourist information, read our Bandon trip builder . San Francisco to Bandon is an approximately 5.5-hour combination of flight and bus. You can also drive; or take a bus. While traveling from San Francisco, expect a bit cooler days and about the same nights in Bandon, ranging from highs of 62°F to lows of 49°F. Wrap up your sightseeing on the 19th (Sun) early enough to travel to Grants Pass. Grants Pass is a city in, and the county seat of, Josephine County, Oregon, United States. Kick off your visit on the 20th (Mon): take in the exciting artwork at The Glass Forge, look for all kinds of wild species at Wildlife Images - Rehabilitation & Education Center, then do a tasting at Del Rio Vineyards & Winery, then look for gifts at Lillie Belle Farms, and finally examine the collection at Bear Hotel Artworks Museum. To see other places to visit, maps, where to stay, and other tourist information, read our Grants Pass journey builder site . Traveling by car from Bandon to Grants Pass takes 3 hours. Traveling from Bandon in May, plan for little chillier nights in Grants Pass, with lows around 42°F. Finish your sightseeing early on the 20th (Mon) so you can travel to Cannon Beach. Cannon Beach is a city in Clatsop County, Oregon, United States. Start off your visit on the 21st (Tue): enjoy the sand and surf at Cannon Beach, then explore the striking landscape at Haystack Rock, and then stop by Cannon Beach Bookstore. Get ready for a full day of sightseeing on the next day: enjoy the sand and surf at Hug Point State Recreation Site and then enjoy the sand and surf at Manzanita Beach. To find other places to visit, more things to do, and more tourist information, read our Cannon Beach trip planner . Drive from Grants Pass to Cannon Beach in 5.5 hours. Alternatively, you can fly. Traveling from Grants Pass in May, expect a bit warmer with lows of 48°F in Cannon Beach. Finish up your sightseeing early on the 22nd (Wed) so you can go by car to Hood River. The city of Hood River is the seat of Hood River County, Oregon, United States. 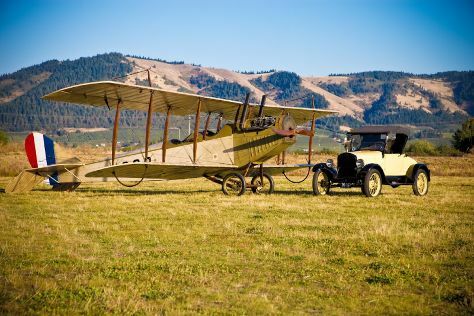 Start off your visit on the 23rd (Thu): examine the collection at Western Antique Aeroplane & Automobile Museum and then contemplate the waterfront views at Columbia River Gorge National Scenic Area. To see photos, reviews, where to stay, and more tourist information, refer to the Hood River trip itinerary builder website . Getting from Cannon Beach to Hood River by car takes about 3 hours. Other options: take a bus; or do a combination of bus and train. Expect a daytime high around 67°F in May, and nighttime lows around 49°F. Finish your sightseeing early on the 23rd (Thu) to allow enough time to drive to Portland. Give yourself a bit of retail therapy at Powell's City of Books and Northwest (Nob Hill). Step out of the city life by going to Oaks Bottom Wildlife Refuge and Eagle Creek Trail Park. When in Portland, make a side trip to see Evergreen Aviation & Space Museum in McMinnville, approximately 56 minutes away. It doesn't end there: examine the collection at Portland Art Museum and identify plant and animal life at Hyland Forest Park. For ratings, photos, maps, and tourist information, you can read our Portland trip planner . You can drive from Hood River to Portland in 1.5 hours. Other options are to take a bus; or take a train. In May, daytime highs in Portland are 70°F, while nighttime lows are 51°F. Wrap up your sightseeing on the 26th (Sun) to allow time to travel to San Francisco. Museum-lovers will get to explore Exploratorium and San Francisco Maritime Museum/Aquatic Park Bathhouse Building. Union Square and City Lights Booksellers are good opportunities to explore the local culture. There's still lots to do: take a memorable tour with Tours, kick back and relax at Fort Funston National Park, examine the collection at Cable Car Museum, and take a leisurely stroll along Fisherman's Wharf. To see more things to do, where to stay, other places to visit, and tourist information, go to the San Francisco trip planning tool . Getting from Portland to San Francisco by flight takes about 4 hours. Other options: do a combination of flight and train; or drive. In May, daily temperatures in San Francisco can reach 69°F, while at night they dip to 53°F. Finish your sightseeing early on the 31st (Fri) so you can travel back home.